The power of the extranet in Bitrix24 is easy to overlook among all of the functionality of Bitrix24. That is unfortunate, because the extranet can be the most productive part of Bitrix24 for certain types of users. To a good approximation, the Extranet can be thought of as an unlimited number of miniature intranets. First, let’s talk about what the Extranet is. It is a little misleading to think of the extranet as ONE thing. 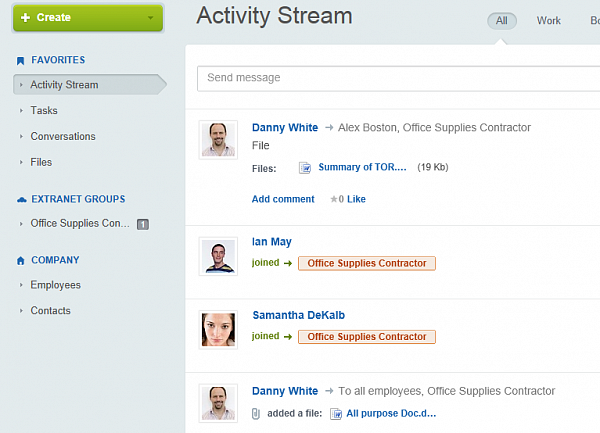 In fact, the Extranet is simply the various independent workgroups that are created as “extranet” groups. These groups are separate not only from the intranet side, but from each other as well, meaning that members of Extranet Group A will not see Extranet Group B, or any intranet groups. Extranet groups generally have mixed membership – one or more employees are grouped with one or more external users. Intranet users which are members the group can see (or turn off) the updates of this group in their usual activity stream. Tasks from the Extranet are visible in the user’s usual task list, as well. 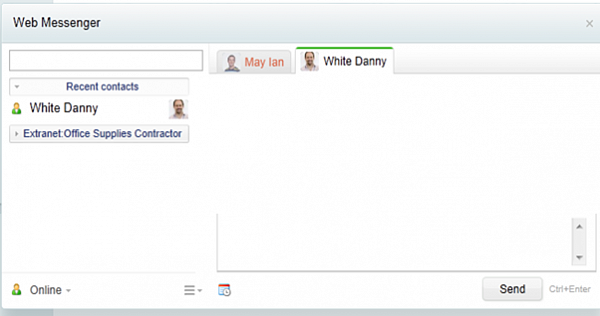 A screen shot from a user who belongs to a single Extranet group makes the concept clear. For this user, the activity stream consists of updates pertaining to the group and to her personal activities. Messages sent to all employees (as in the last entry in the screen shot), will not show up in this user’s activity stream unless the Office Supplies Contractor group, or the user herself, is included in the To: field of the message. The Extranet is advertised as an area to work with clients, partners, suppliers, and other third parties. Importantly, it has no lim itations on the number of groups that can be created, nor on the number of users which can be included in those groups. So a web designer or marketing agency could create an Extranet group for each client and use the tools inside the group to share files and discuss changes that need to be made. All the historic versions of files, all discussions, instant messages, and tasks are collected in one place, accessible to everyone. Similarly, a large team, such as one put together for a fundraising event, can be created and members can be invited in quickly and fluidly. Lim itations on posts and files can be implemented, because extranet users can be made moderators of the group. A large extranet group can operated in its own little world without interfering with the operations of employees in the intranet, just as private as the single client group above. Unlike the intranet, extranet users exist in a tightly controlled environment. Thus, in our experience, companies which need workspaces with clients, or which want to give individual work teams their own space without interaction among them, actually have extranets which are actually more active than their intranets.